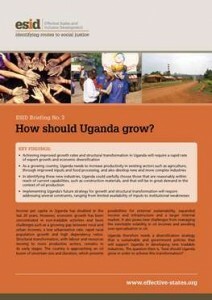 Income per capita in Uganda has doubled in the last 20 years. However, economic growth has been concentrated in non-tradable activities and faces challenges, including rapid rural population growth, high dependency ratios and an approaching oil boom of uncertain size and duration. ESID research uses a new understanding of how structural transformation unfolds: the theory of deepening economic complexity. It evaluates Uganda’s opportunities based on the country’s current level of economic complexity, identifies appropriate strategies, and offers policy recommendations that take into account challenges and constraints identified in Uganda. Achieving improved growth rates and structural transformation in Uganda will require a rapid rate of export growth and economic diversification. As a growing country, Uganda needs to increase productivity in existing sectors, such as agriculture, and also develop new and more complex industries. In identifying new industries, Uganda could usefully choose those that are within reach of current capabilities, such as construction materials, and that will be in great demand during oil production. Implementing Uganda’s future strategy for growth and structural transformation will require addressing several constraints, ranging from limited availability of inputs to institutional weaknesses.